A documentary film directed by Adam Finberg and produced by Greg Horvath | Review by Tom Horvath, Ph.D.
What do you really know about the addiction rehab industry? Like most people, you may be under the impression that addiction treatment is a life-saving, highly ethical enterprise, with services provided by highly trained professionals. You might also think these professionals utilize addiction treatment methods based on the latest scientific research and hold themselves accountable to the highest standards. If so, you will likely have a very different perspective after you see this film. 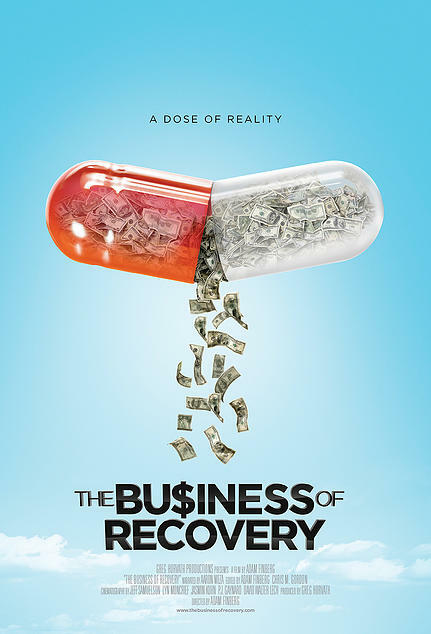 The Business of Recovery is a must-see film for every one of us. In the US alone, more than 2/3 of families have been touched by addiction and over two million people enter some level of addiction treatment each year. None of us are immune. This issue will affect you and someone you care about. You need to be informed. This film follows the true story of several individuals and their families as they embark on their journey to recovery. It reveals their experiences in addiction treatment and includes interviews with multiple treatment “experts” connected to the 35 billion dollar treatment industry. The contrast between the expert statements and the truth is dramatic. The experiences and outcomes of treatment for the individuals interviewed are far less than ideal. The Business of Recovery reveals the extremely low ethical standards of the rehab industry and the truth behind the many unlicensed and unprofessional individuals who run it. The unfortunate reality is that vulnerable families who are seeking help for a loved one in crisis are being met with high-pressure sales tactics rather than compassionate care and reliable information. The self-interest of the addiction treatment industry is shockingly apparent. Be prepared: The client stories in this film are infuriating and heartbreaking. The mission behind The Business of Recovery is to educate the public and bring about change. The public needs to demand: 1) better government regulations and oversight, 2) science based treatments, and 3) a higher level of education for those who treat addiction. Scientifically based addiction treatment does exist. However, many US treatment facilities appear to operate largely in isolation from this body of scientific work. Unbelievably, several high profile treatment industry leaders interviewed in this film appear to be unaware of this science. Since the 1980’s, scientific reviewers have suggested that the US addiction treatment system appears to be based on treatments that have the least evidence of effectiveness. This film reveals that decades later the situation has not changed. Although critics of US addiction treatment have been aware of this situation for many years, few in the general public appear to be aware of it—until now. I hope this film leads to public outrage about the addiction treatment industry. It is also my hope that this film creates more sophisticated consumers of rehab services and provides an impetus to improvements in government regulation and overall standards within the addiction treatment industry. The process of getting to these outcomes will be tedious and tumultuous. Many individuals may leave the field or lose their jobs, and many organizations will need to radically re-shape themselves or cease to exist. Nevertheless, these changes are long overdue. A sneak preview of The Business of Recovery was shown to a packed audience on March 27, 2015, at the Phoenix Film Festival. The official world premiere is scheduled for Sunday, April 26 at 7:45 pm at the Newport Beach Film Festival. A second showing will screen on Tuesday, April 28 at 5:00 pm. Disclaimer: Dr. Tom Horvath, the author of this piece, was interviewed extensively for this film, both on and off camera. A small portion of his on-camera interview is included in the film. His company, Practical Recovery, operates two inpatient rehabs, an outpatient rehab and provides sober living and detox services. It is his belief that it is possible to provide addiction treatment in a responsible, ethical and transparent manner. The producer of the film, Greg Horvath, is unrelated to the author.